This weekend marks the limited theatrical release of writer-director David Lowery’s Sundance hit drama Ain’t Them Bodies Saints, and while this of course means premieres, critical reviews and the like, Lowery is already offering the masses an additional story about the film’s main characters, Bob Muldoon (Casey Affleck) and Ruth Guthrie (Rooney Mara). Following in the footsteps of bigger budget films, Ain’t Them Bodies Saints received the graphic novel treatment, albeit in a limited format, which Entertainment Weekly is awesomely hosting in its entirety. Isn’t it nice when filmmakers and production companies don’t feel the need to relieve us of our money for extra material? (Pacific Rim graphic novel, we’re talking about you.) And from an indie movie, no less. 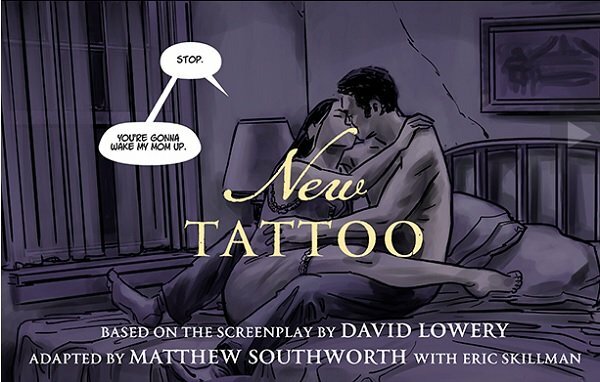 Adapted by comic artist and musician Matthew Southworth, with art by Criterion Collection designer Eric Skillman, this prequel story is titled New Tattoo, and gives us a look into the Bonnie and Clyde-lite lifestyle the two young loves are living before the events of the film pull them apart. Initially, Lowery penned the story hoping to film it as a short to follow-up the feature, based purely on how much fun the director had with scenes where Affleck and Mara actually appeared together. “Casey and Rooney and I talked about it on set,” Lowery explains, “that we wanted to prolong that experience. But it never worked out because everyone’s schedules are so complex.” One suggestion from IFC Films later, and the short comic came together. You can take a look at the cover page and first two pages below. It’s a nice, subdued story embedded with dread that thankfully doesn’t end in gallons of bloodshed. Southern lovers with guns are almost never a good thing when it comes to fiction, and the relationship between Bob and Ruth is captured subtlely but assuredly. The titular tattoo’s presence adds the extra emotional tug to a story that has admittedly been seen time and time again. I guess that’s why they chose that title. Not that the trailer doesn’t do a good job of hinting at this couple’s relationship, but this was a great touch, and it’s pretty fitting, given one of Lowery’s upcoming projects will be an adaptation of Brian Michael Bendis’ gruesomely fantastic graphic novel Torso. If you haven’t gone out to see this one yet, maybe the trailer below will get you in the mood.